Matt Carpenter is playing third base this season but also has spent considerable time at second and first base in his career. 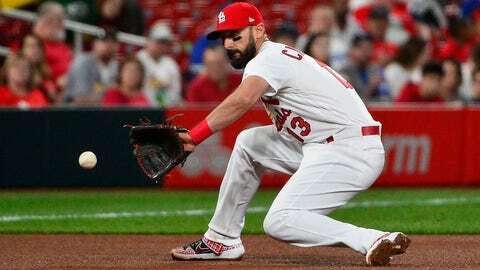 ST. LOUIS — Three-time All-Star infielder Matt Carpenter and the St. Louis Cardinals have agreed to a contract that adds $37 million in guaranteed money for 2020 and ’21, a deal that includes an option for 2022. The 33-year-old has a $14.5 million salary this season a part of a six-year, $52 million deal that included an $18.5 million club option for 2020 with a $2 million buyout. Under the new deal, he has guaranteed salaries of $18.5 million in both 2020 and ’21, and the Cardinals have an $18.5 million option for 2022 with a $2 million buyout. The 2022 salary would become guaranteed if he has 1,100 plate appearances combined in 2020 and ’21, including at least 550 in ’21. He has a .273 batting average with 134 home runs and a .376 on-base percentage in 1,031 games since debuting in 2011 with the Cardinals. Carpenter was an All-Star in 2013, 2014 and 2016. He finished among the top 10 in MVP voting in 2013 and last year. Carpenter was a 13th-round draft pick by the Cardinals in 2009. He became the fourth St. Louis player since February to sign a long-term deal after first baseman Paul Goldschmidt, pitcher Miles Mikolas and outfielder José Martínez.